This post originally appeared on Seattlest. As spring arrives in Seattle, there are a few things that are like clockwork with the season. There will be the lament of the weather (really, this is an every season thing), the underachieving debut of our home nine Mariners, and the arrival of asparagus. There are few foods that signal the arrival of spring like seeing asparagus at your local market. It’s a uniquely wonderful vegetable, but it always raises questions. As in, how do I prepare it? What wine goes with it? And the biggie, why does it make my pee smell? Well dear readers, join us as we try to find some answers. Asparagus is a great vegetable to work with as it is amenable to several different cooking techniques. Shave it raw as a salad. Toss it in olive oil, salt, and pepper and throw it on the grill. Do the same treatment and place it in a skillet. Heck, put a fried egg on top. Take a big batch and roast it. Drench it in a hollandaise or another rich sauce. The folks at Gilt Taste launched their new website with a recipe for salt & sugar cured asparagus poached in butter. It’s a versatile vegetable; steamed, boiled, pickled; asparagus can do it all. But first things first, you’ll need to pick it out. You’ll find spears of pencil-width or those of finger-width. Some people say that the thinner ones will be more tender, while some find the thicker spears more flavorful. Next, you’ll need to take off the base of the spear. This is often woody, fibrous, and not tasty. Don’t eat this. Break it off by holding the base and the body of the stalk; it’ll snap at its natural breaking point. Now you can get cooking. Ask any wine guy/girl a good wine pairing with asparagus and be prepared for some hemming and hawing. Why? Because of those green bitter flavors that are so prevalent. Couple this with their strong scent and you have a food that makes wine people freak out. In trying a wine with asparagus, look for something that can match the green herbal notes, something like Sauvignon Blanc or a bright Gruner Veltliner would step up to the challenge. Riesling or a Spanish Albarino would be good too. Or don’t try to get cute with wine and just have beer with it. Ultimately, when the subject of asparagus comes up, the conversation will inevitably turn to why it makes your pee smell. When the mega-food guy Mark Bittman was on the Today show recently, Matt Lauer couldn’t resist and asked why it makes your pee smell. Basically, it comes down to some chemical compounds that are present in asparagus. Here is where it gets tricky; not all people will create the smelly pee. In studies, the ratios of smelly versus not varies. And it gets even trickier; in studies, some people can’t even smell the nastiness. Lucky them. If you’re in doubt, try some asparagus and get thee to the water closet. 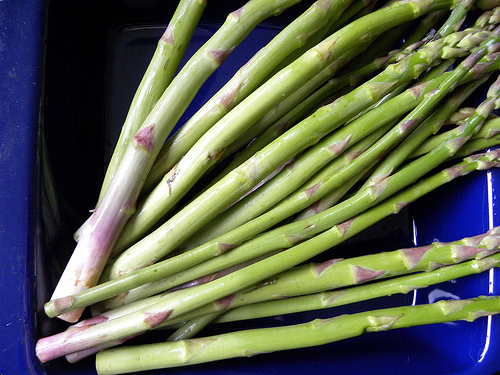 Asparagus has been known to make things stinky in 15 minutes. There you have it. You now have ideas of what to eat with asparagus, what to drink with asparagus, and what your body does with asparagus. So head on out to your local farmer’s market and take in spring. Get some asparagus, grab a coat, and hope for the best with the Mariners.